Tactical Carbine Level II is a two-day course which builds on Tactical Carbine I and is designed to refine the skills already learned by the student who uses his weapon in a tactical environment. We begin by going further in depth on the basics that the students learned in the previous two classes. The course then dives into advanced shooting drills utilizing realistic shooting situations. This course focuses on realistic shooting engagements, utilizing unconventional platforms and close quarters and contact shooting. This course will push your stress limit and speed limit with a carbine. Pistol, holster, belt, three pistol magazines, pistol magazine holders, carbine, sling, four carbine magazines, carbine magazine holders, wraparound clear eye protection, ear protection, weapons cleaning kit, water bottle, and rain gear. Knee pads and elbow pads are highly recommended. *Caution: This course involves strenuous physical activity (including sprinting and awkward prone positions with a firearm in your hand) and a much higher degree of weapons handling, awareness and safety. 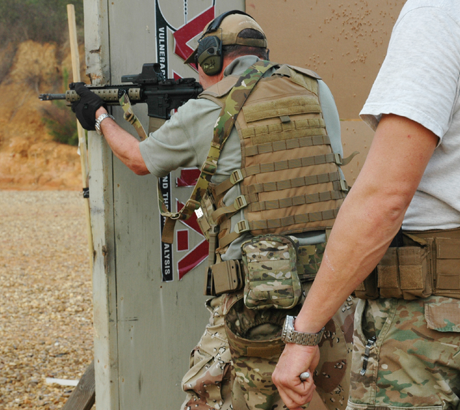 While Intro to Tactical Carbine and Tactical Carbine Level I are prerequisites, attendance in those courses does not guarantee that a student is prepared to take this course. It will be at VATA's discretion to determine if a student needs additional training before attending this course.